Cryptocurrency mining is one way of earning extra coins from the digital currency industry. Initial Bitcoin miners are known to have made massive profits from mining. However, due to various factors, mining profitability has declined. With time, mining has evolved with different options hitting the market. Currently, one can download mining software and start earning. Mining software is ideal for cryptocurrency enthusiasts who would like to earn without going through the difficulties of purchasing multiple high-end GPU rigs. One of the popular software is NiceHash. NiceHash Miner is a free mining software that links sellers and buyers of computing hashing power. The platform allows sellers to rent their computing power and in return earn Bitcoins. Since joining the market, NiceHash has become one of the largest hash power marketplaces in the world, with over 170,000 miners, more than 3.3 million orders served, and over 181,000 BTC paid out. All Nicehash services operate in the cloud. In simple terms, Nicehash enables users to rent hashing power in return for a fixed fee. The miners then share the revenue earned during the mining process. The platform reduces costs because mining can take place remotely without the need for expensive mining hardware. A buyer has the capability of selecting their preferred cryptocurrency to mine. They, therefore, put a price tag for the seller’s hash power and place an order. If the hashing power sellers show interest, the order is then fulfilled. On the other hand, miners can operate the NiceHash mining software or link it to ASICs and the normal PC to NiceHash stratum servers and clear the order by the buyer. In terms of payment, earnings are in Bitcoin. The seller of computing power is compensated in Bitcoin for each valid contribution he made to the mining process. Before becoming a NiceHash buyer, you need an account which is created on the NiceHash website. You need an email and a strong password. 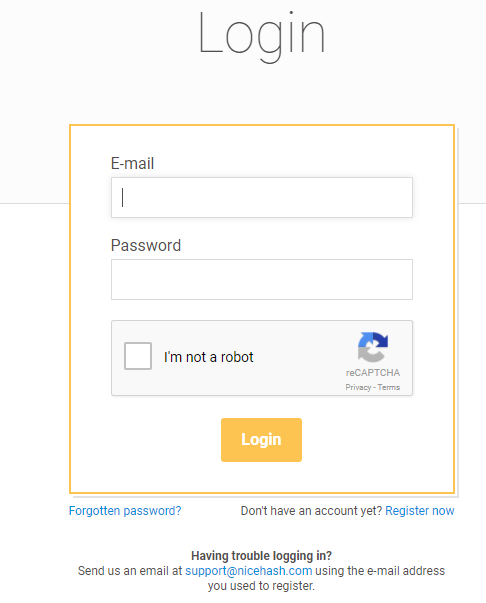 You will then confirm the email and log into the account. NiceHash will then provide an internal NiceHash Bitcoin wallet for depositing and withdrawing Bitcoins. Sellers can use the wallet to receive the payment for hashing power. Note that any amounts lower than 0.001 Bitcoins cannot be withdrawn. Furthermore, with the wallet, you get rig monitoring and on-website technical support. To buy hashing power, you will need a minimum of 0.005BTC. Buyers on the platform can enter into contracts of less than a day and the price varies based on the market price of the cryptocurrency. Furthermore, the total mining difficulty of the relevant algorithm also plays a major role. Buyers can enter into two types of contracts: The standard bidding contract. This contract allows you to tweak the price at the value you want. We also have a fixed contract, where the price is set higher than in the case above but is fixed for the duration of the contract. To buy the hashing power, you will need an account and a minimum deposit of 0.005BTC. Select the cryptocurrency you would like to mine alongside the pool. Save the pool data to your NiceHash list of pools then verify it with the NiceHash Pool Verifier. You will then place a new order in the marketplace. Pick your algorithm and select either the EU marketplace or the U.S. marketplace. Each marketplace comes with its own pricing for standard and fixed orders. Lastly, go to your pool and check your earnings. To sell hashing power, you will need some computer hardware capable of mining. Then download the NiceHash mining software and register an account where you will deposit your mining profits. Finally, you will run the software. Using NiceHash services attracts some fees. For buyers, NiceHash charges a non-refundable 0.0001 BTC fee for any new order and 3% fee on what you spend on buying hashing power. However, sellers on the NiceHash platform have a unique scale. For payouts for balances of less than 0.1 will be charged 5% for the external wallet. Payouts for balances greater than or equal to 0.1 BTC to the external wallet is charged at 3%. Lastly, payouts for balances greater than or equal to 0.001 BTC to NiceHash wallet is 2%. Withdrawals from NiceHash internal wallet to an external wallet are subjected to the withdrawal fee. This will depend on the withdrawn amount and withdrawal option. Withdrawals are manually confirmed once on a daily baisis. Deposits to NiceHash wallet are subjected to the deposit fee, which depends on the deposited amount. NiceHash also has a referral bonus. The bonus includes a 5% revenue share of what NiceHash earns from your referral. NiceHash advises on various measures to keep your account secure. The platform puts emphasis on keeping your email secure. To check if your email has ever been compromised you need to can use the HaveIBeenPwned service. It is a good practice to have a separate email for financial or crypto related accounts. Furthermore, NiceHash employees do not have access to user passwords. The platform recommends users to use password managers like KeePass. Additionally, the platform has a two-factor-authentication feature. This feature greatly reduces the risk of being hacked online. NiceHash has a mining profitability calculator where you plug in the type of hardware you are using and the electricity charges. The calculator will then predict your profits during the specified timeframe. A user can tell the approximate profit in a day, week or even month. As a result of Bitcoin price variations, not all hardware will be profitable. However, NiceHash profitability has significantly declined due to various factors. The mining sector has been overflooded something that has a direct negative impact on profits. Furthermore, security concerns have forced many people to ditch NiceHash, something that has affected its profitability. NiceHash is beginner friendly. Due to its relatively easy setup, less risk involved and easy one-click operation, NiceHash is very beginner friendly. One does not require technical knowledge to set up the platform. Multi-algorithm. NiceHash picks the most profitable algorithm to mine for you after reviewing your hardware. Hence, you will always be mining the best bang for buck portable coin. Bitcoin only payouts. With the high Bitcoin transaction fees, NiceHash is not a good choice for smaller miners, but with the potential inclusion of altcoin payouts, it might be an option for some. Minimal profits. Compared to pool mining, NiceHash mining has minimal profits. NiceHash is one of the biggest mining marketplaces for cryptos. The platform is easy to set up and does not require any technical knowledge. NiceHash is a good option for those looking to either sell or buy higher hash rates to get more profitable mining results. Furthermore, the mining calculator lets know how much you will earn from your mining venture. NiceHash is a platform worth trying if you are comfortable with the fees and open to the idea of automated mining.